The “theory of everything” was the basis of world renowned English physicist Stephen Hawking’s first work in the 1960s. He believed there was one all-encompassing framework of physics that links together everything in the universe. While the “theory of everything” has yet to be proven – even Hawking himself has retracted his support for the premise – it seems that director James Marsh is a staunch supporter judging by his Hawking biopic. Rather than delve into the gritty, fragmented complexities of Stephen and Jane Hawking’s life, or the tumultuous nature of their marriage, Marsh is happy to depict their story as simply as possible. The Theory of Everything, censored and sanitised, exists in an idealistic bubble that manages to portray everyone associated with the Hawking’s story as amicable, honest folk without a malicious bone in their body. It just doesn’t ring true. The source material, Jane Hawking’s memoir Travelling to Infinity: My Life with Stephen, presents their marriage as far more volatile and challenging. The film’s authenticity is further diminished in comparison. Stephen Hawking’s (Eddie Redmayne) story is miraculous. Despite being diagnosed with amyotrophic lateral sclerosis (ALS) in his 20s, a slow progressing motor neuron disease that would eventually leave him totally paralyzed, he has managed to become one of the world’s leading scholars in physics. He’s also had three children from a thirty year marriage to Jane Wilde (Felicity Jones), a relationship that endured and flourished despite his ostensibly terminal diagnosis in 1963. It’s Stephen and Jane’s relationship, rather than his academic achievements, that dominates The Theory of Everything. In that regard, the film can be seen as a rather unconventional love story above all else. Yet their relationship is built on a surprisingly flimsy foundation. Upon diagnosis, Jane unilaterally agrees to care for Stephen despite the difficulties inherent to longterm care. She takes on a massive commitment and displays an inspiring amount of loyalty to Stephen even though it appears they’ve just met in the film. But since we are never privy to the story of how the the couple’s love blossomed, her dedication seems sudden and unconvincing. There’s a lack of passion throughout The Theory of Everything. I never believed these two people loved each other enough to forge a bond that could withstand Stephen’s predicament. The film plods along without ever hitting any rousing high notes or shattering low ones. There are no revelations to be found in the film: only a safe, idyllic retelling of Jane and Stephen’s time together. The most surprising thing about the movie is that director James Marsh handles Stephen’s debilitating disease with little incident. I’m not advocating a perverse masochistic examination of his condition, but I believe a more harrowing look at the difficulties of ALS would have made his story more involving. We see the monumental effort it takes Stephen to perform simple tasks – drinking tea, putting on a jumper or eating dinner – without ever truly feeling the pain and shock at having your very existence taken away from you. Once again, the film’s inspirationally punishing core is conspicuously absent. 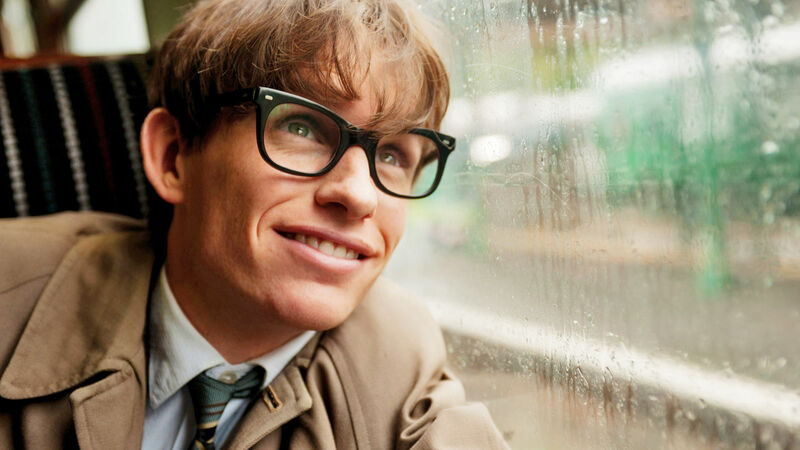 By virtue of Hawking’s condition, the focus is always going to be on Eddie Redmayne’s performance. He’s truly outstanding in a challenging role that requires delicate mastery in order to fully capture Hawking’s physicality. He’s clearly done his research. Sadly, his depiction of Stephen before his condition is clichéd as he’s stereotyped as a goofy, socially awkward but endearing geek. Regardless, Redmayne will be an award season frontrunner for his turn as Stephen, and if you’re looking for a perfect piece of imitation acting, then you’ll be hard-pushed to find much better. Redmayne is excellent at mimicking Hawking, but it’s his wife Jane (Felicity Jones) who really deserves the credit. Once you’ve gotten over how terribly posh and proper she is, Jones is superb as Jane. It’s not a loud, passionate turn filled with life, but neither is the film. Instead Jones subtly conveys the internal strain of her responsibility. 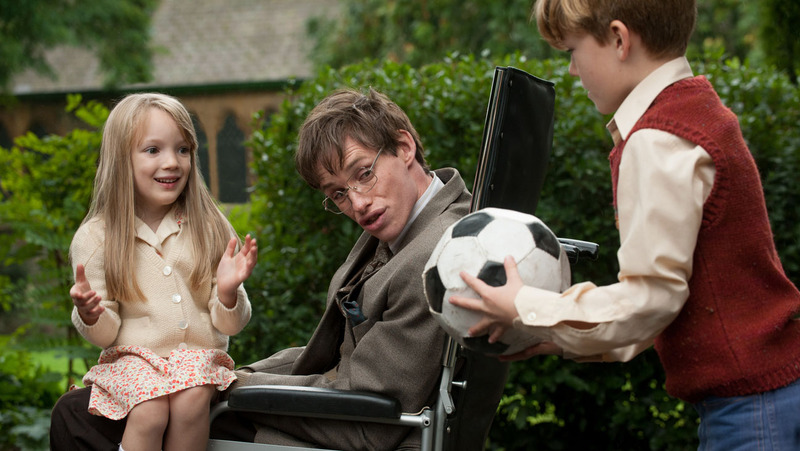 As a result of Hawking’s debilitated state it’s up to Jones to carry a majority of the film’s narrative thrust. She does this admirably. Benoît Delhomme’s cinematography is polished without ever pushing boundaries. Scenic shots of picturesque Cambridge depict the 60s era of Hawking’s life in an obvious grainy sepia filter. The aesthetic works on a basic level but the style is formulaic and predictable, indicative of the film’s desire to play it painfully safe. The neatest motifs come when coffee, staircases and even the wheels on his chair transform into the swirling universe, visually reflecting Hawking’s theory on diminishing black holes. Jones and Redmayne’s central performances are the shining stars in The Theory of Everything’s lacklustre universe. Their excellent work is constantly let down by the simplistic, cack-handed triteness of Marsh and Anthony McCarten’s writing. The film is less a piercing retrospective and more a Sunday night BBC drama in its inoffensive scope and simple, biographic-led narrative. Marsh’s neutral stance becomes the film’s Achilles’ heel, leading to an underwhelming spectacle that lacks punch.